Sakaibara Shigematsu was born to a wealthy and politically influential family near Misawa in northern Honshu and graduated from the Naval Academy in 1918. He served on a number of surface ships and, after being promoted to the rank of captain, in various staff positions. He had a reputation as a "gentleman soldier" who praised the rural lifestyle and integrity of the common Japanese. Sakaibara commanded the Japanese garrison of Wake in late 1943. 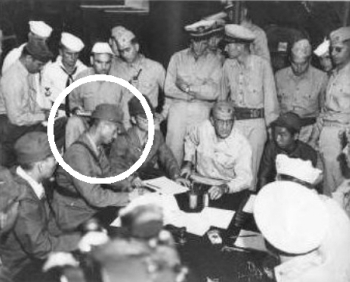 On 5 October 1943, infuriated by a devastating carrier raid on the island, he ordered the execution of almost 100 American prisoners, former civilian construction workers who were on the island when it fell to the Japanese in December 1941. The last prisoner was beheaded by the admiral's own hand. On 15 October 1944 he was promoted to rear admiral, and on 4 September 1945 he surrendered Wake to the Americans. Sakaibara was tried and hanged for the 1943 atrocity after the war.